Share the love with a TONI&GUY Gift Card. Save all your gift-giving headaches and treat that lucky someone to the TONI&GUY experience. Visit your nearest salon to buy a card, top it up with any choose any amount between £10 and £150 and we’ll put it in a beautifully branded wallet. Can’t get to a salon? No problem. Simply buy your gift card online, choose an amount between £10 and £50 and we’ll post it directly to you. You’ll be treating someone special to some of the country’s leading stylists and technicians, helping them to achieve the beautiful end result that they’ve been dreaming of. 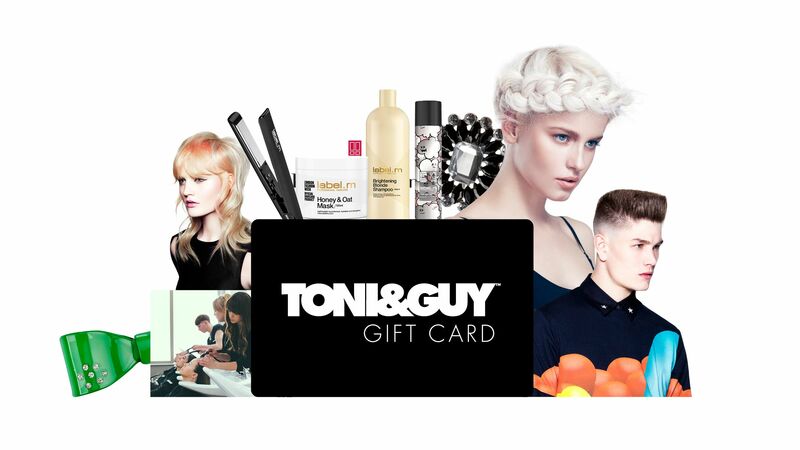 The TONI&GUY Gift Card can also be used against any salon service, treatment or your haircare product for you to take home. To register your card in case it gets lost or stolen, or to check the balance click here. You can obtain a TONI&GUY Card free of charge at any participating TONI&GUY salons. The TONI&GUY Card is issued by, and remains the property of, Mascolo Limited, 58-60 Stamford Street, London, SE1 9LX. You can use a TONI&GUY Card at any participating TONI&GUY or essensuals salons to purchase hair services, treatments and associated hair products. It cannot be used outside this limited network. It is not a credit card, charge card or debit card. Before you can use a TONI&GUY Card you will need to have it credited with funds. The TONI&GUY Card will be activated when you first credit it with a minimum of £10. You can credit a TONI&GUY Card by using a credit or debit card or with cash at any participating TONI&GUY salon. The minimum value you can credit your TONI&GUY Card with is £10; the maximum amount is £150. The maximum credit value you can store on your TONI&GUY Card at any time is £150. You can check the balance on your TONI&GUY Card at any time online or in any participating TONI&GUY or essensuals salons. Your TONI&GUY Card does not have an expiry date. However, if you do not use your TONI&GUY Card for a period of two years or more, the TONI&GUY Card will cease to be valid and any remaining credit value stored on it will expire. Checking the balance on a TONI&GUY Card will not constitute use of the TONI&GUY Card for these purposes. Expired value cannot be transferred to a new card or redeemed. You will not be able to use the TONI&GUY Card once it has ceased to be valid. To protect the stored value on a TONI&GUY Card from loss, theft or damage you can register the TONI&GUY Card by following these instructions. You should treat your TONI&GUY Card like cash in a wallet. If you lose your TONI&GUY Card or if it is stolen you may lose any value which is stored on it in the same way as if you lost your wallet. If you have registered your TONI&GUY Card through the TONI&GUY website, you should report immediately any loss, theft, fraudulent or unauthorised use of your TONI&GUY Card to TONI&GUY Customer Services on 0207 921 9000. In the event of loss, theft, fraud or other unauthorised use of your TONI&GUY Card, or if your TONI&GUY Card is damaged or malfunctions, Mascolo Limited may, at its sole discretion, replace your TONI&GUY Card and transfer any credit value stored on it to the new card. Circumstances in which Mascolo Limited may determine, in its sole discretion, that it will not replace your TONI&GUY Card include those where it reasonably believes that the notified incident has been caused by your wilful breach of these Terms and Conditions or if there are reasonable grounds for suspecting that you are or have been engaged in fraudulent or other unlawful conduct. Alternatively Mascolo Limited may, at its sole discretion, procure a redemption payment in respect of any outstanding value stored on your TONI&GUY Card. If Mascolo Limited agrees to replace your TONI&GUY Card, a replacement card will be delivered to your registered home address, usually within five days of you first notifying Mascolo Limited of the incident. If Mascolo Limited decides to redeem any outstanding balance to you, the redemption payment amount will be paid to you either by electronic credit to the debit or credit card that you most recently used to load up your TONI&GUY Card or by cheque to your registered home address, but the redemption fee will not be charged. Replacement cards will be posted to your registered home address only. Mascolo Limited reserves the right to charge a replacement card fee for each replacement card in the event that you are issued with more than two replacement cards within any six month period. If you subsequently find or retrieve a TONI&GUY Card which you have reported lost or stolen, you must notify us immediately. All complaints will be subject to the TONI&GUY Complaints Procedure, which will be provided to you on your request. The Financial Ombudsman Compensation Service is not applicable to your TONI&GUY Card. Mascolo Limited do not offer any other compensation schemes to cover losses claimed in connection with your TONI&GUY Card. Mascolo Limited shall not be liable for any default resulting directly or indirectly from any cause beyond our control, including but not limited to, failure of network services and failure of data processing systems. To the extent permitted by law, all conditions or warranties implied by law, statute or otherwise are expressly excluded. Mascolo Limited reserves the right to amend or waive any provision of these Terms and Conditions from time to time and at any time, or to terminate the TONI&GUY Card program on reasonable notice. The Terms and Conditions applicable to the use of a TONI&GUY Card shall at any time be the terms and conditions published on the TONI&GUY website (www.toniandguy.com). Mascolo Limited may assign the benefit of these Terms and Conditions to any other company in the same group of companies as Mascolo Limited. If Mascolo Limited assigns the benefit of these Terms and Conditions, your rights will not be affected. Governing law, these Terms and Conditions are governed by English law.